Hot water (45 liters immersion tank on engine and shore power). Cold shower on the aft deck. Classic motor cruiser for sale in France. 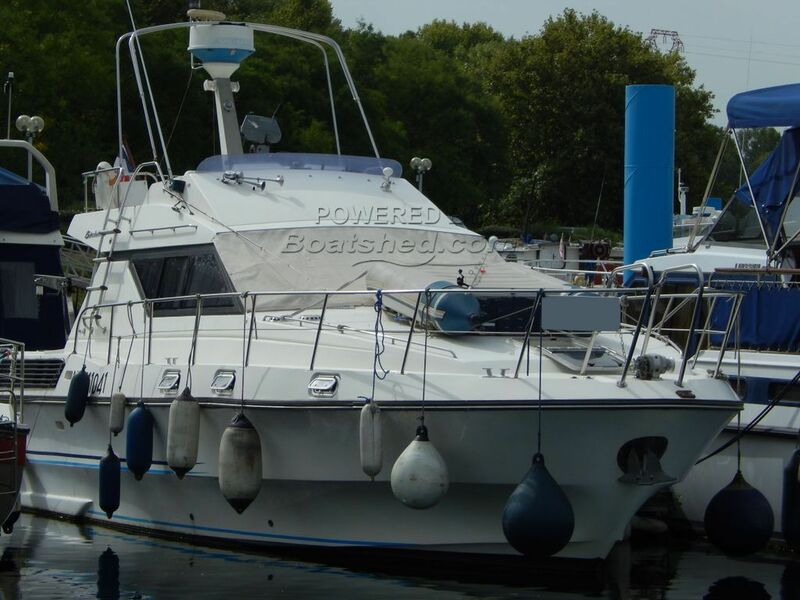 Boatshed Midi Canals is happy to offer this well maintained example of Twin engine BIRCHWOOD TS33 for sale. Our current owner has had this motor cruiser since 1997, still under maritime French flag and located on the Rhone river, between central France and all the river systems and the Mediteranean open sea. Great maintenance and a level of confort will allow a family of 4 with 2 more visitors to spend some great cruising time either on the river or at sea. Ideal fly with several accesses (by ladders on both side decks and another ladder to a hatch from the aft deck) and a convivial aft deck used to entertain or dine and a lot of boat in less than 10m long. Mooring could be transferrable with the port management agreement. For more information or organise a visit, please contact, Graham, your local broker at Boatshed Midi canals. This Birchwood TS 33 has been personally photographed and viewed by Graham WHARMBY of Boatshed Midi Canals. Click here for contact details.